Happy New Year everyone, we hope you had a wonderful break and are ready to get back to wedmin. As you know we like to do things in style here at Rcok My towers, so we thought we’d kick start 2018 off with a beautifully captured outdoor wedding by RMW favs M and J Photography. 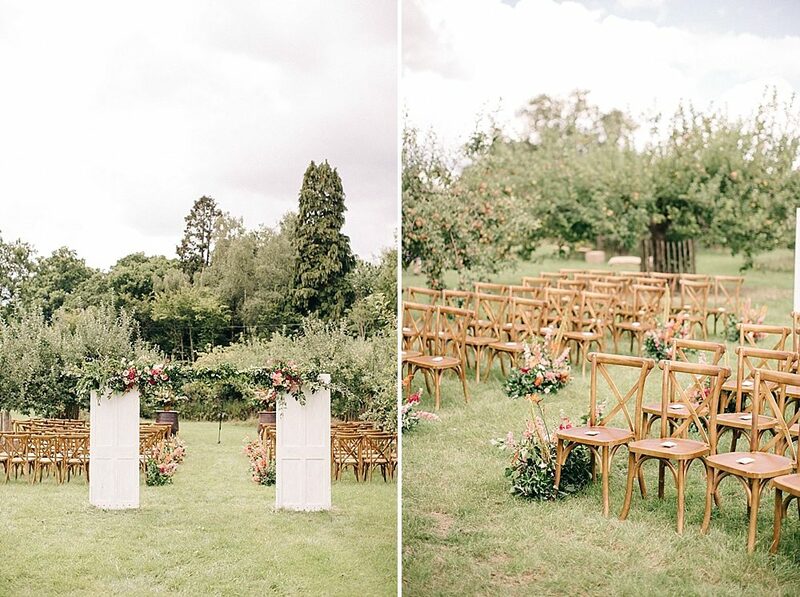 The orchard ceremony is heavenly with the sweetest barn door altar, and the Great Barn reception is utterly mesmerising covered in twinkling festoons and spectacular florals by Joanne Truby Floral Design. I’m certain you will fall for the fashion too. The bridesmaids look adorable in Needle & Thread tulle dresses and bride Annie is an absolute knockout in a exquisite lace Limor Rosen gown. Every last detail will have you weak at the knees, so sit back relax and enjoy every minute. I know I have! Annie the Bride: Having been together for over ten years by the time we got married, Neil and I weren’t too worried about sticking to all the usual wedding traditions, we just wanted the day to feel like ‘us’ and to give our family and friends a great party! We had a long engagement and at times the wedding felt a lifetime away, but it gave us the opportunity to take things slowly and create the day we really wanted. The dress hunt was a lot of fun but more challenging than I’d anticipated! I tried on some beautiful dresses over about eighteen months, but never had ‘that feeling’ that a particular dress was the one (typical of my indecisive nature!). I probably could have gone on forever, but in the end I bit the bullet and chose the gorgeous ‘Norma’ by Limor Rosen – the delicate beading stole my heart and the relaxed style really suited our day. I wanted some alterations to the fit and the wonderful Charlotte at Sewn Right did a beautiful job. I chose gold sparkly block mid heels from Charlotte Mills, drop earrings from BHLDN, a beautiful silk tulle veil handmade by Blossom and Bluebird, and wore fresh flowers in my hair. Neil looked so handsome in his blue suit, made to measure by A Suit That Fits. He accessorised with a dark navy tie, braces and tan brogues. 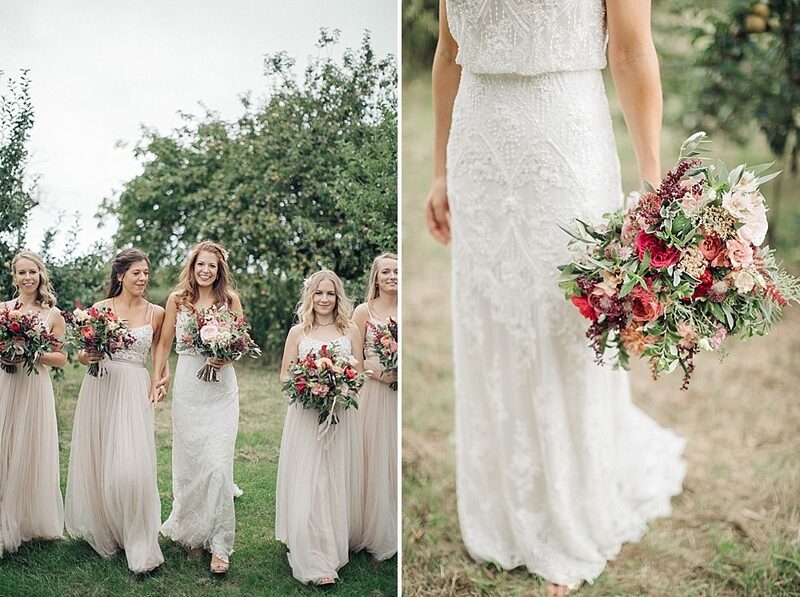 His groomsmen wore a similar suit from Red Herring at Debenhams, and my gorgeous bridesmaids looked amazing in their Needle and Thread blush maxi dresses. 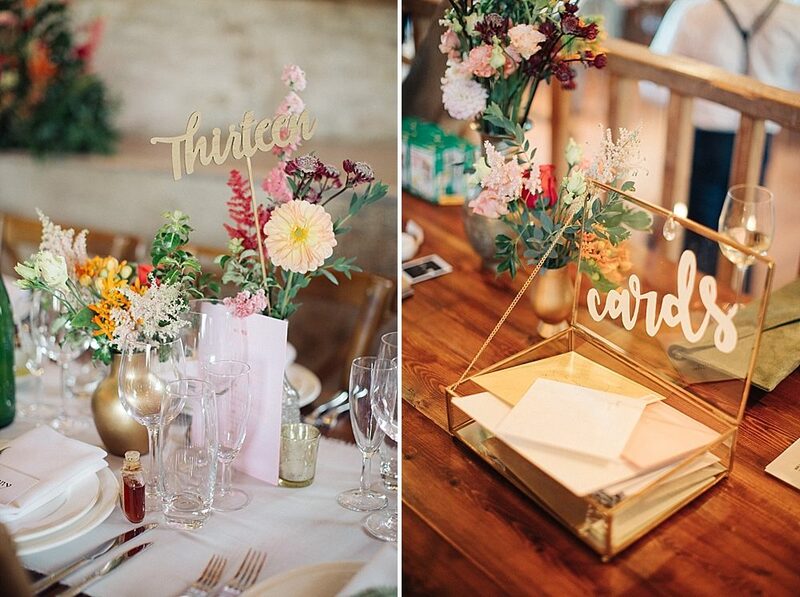 We really wanted a relaxed, informal feel for our day, so finding the right setting was so important. 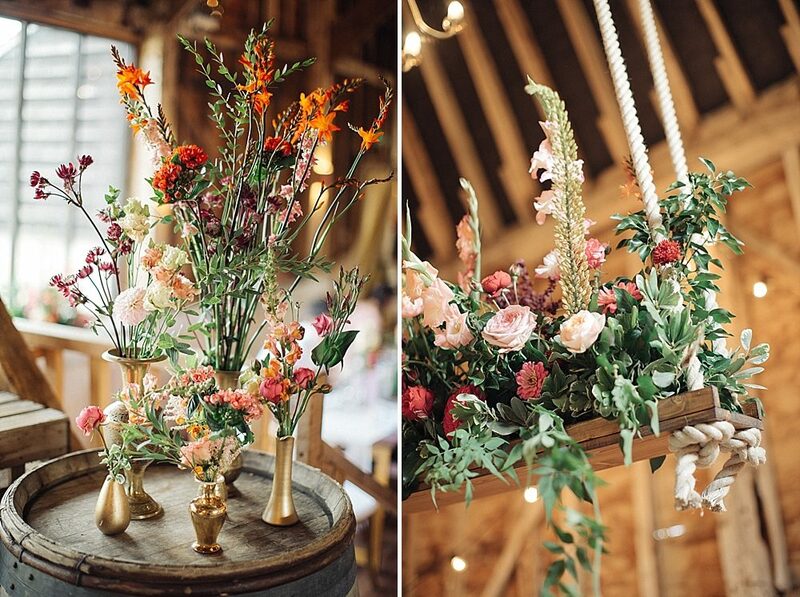 A barn was always at the top of our list in terms of style, and despite a brief flirtation with the idea of a London warehouse wedding, it was totally the right choice for us in the end. I had seen the Great Barn on Rock My Wedding and knew what a special space it was before we even viewed it. 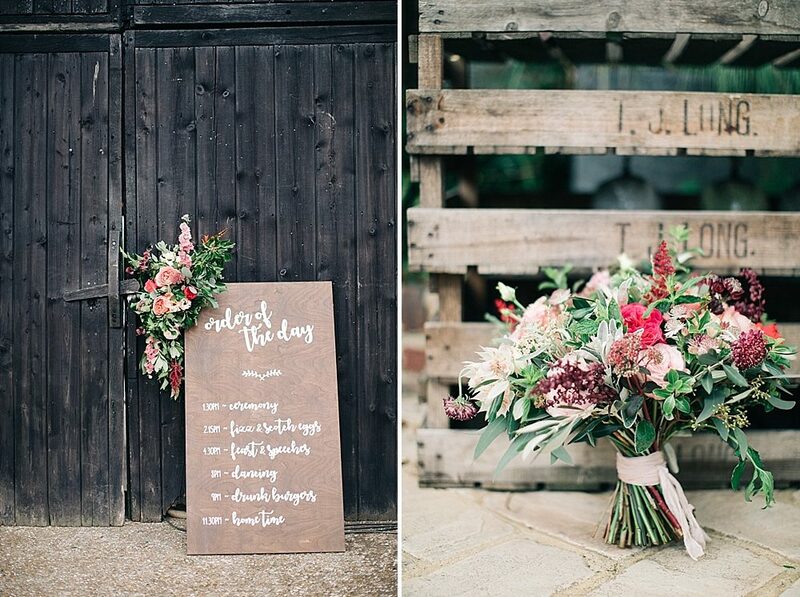 We looked at a couple of similar Kent barn venues, but the Great Barn had everything we were looking for – genuine rustic charm, a beautiful natural outdoor area and the opportunity to get creative with the decor as the barn is totally dry hire. The idea of a blank canvas venue excited and terrified us in equal measure, so we booked Sama of Utterly Wow to provide on the day coordination and design/styling advice. Sama was fantastic and worked so hard on the day to keep everything running smoothly. Our vision for the decor can probably be summarised in two words: festoons and flowers! 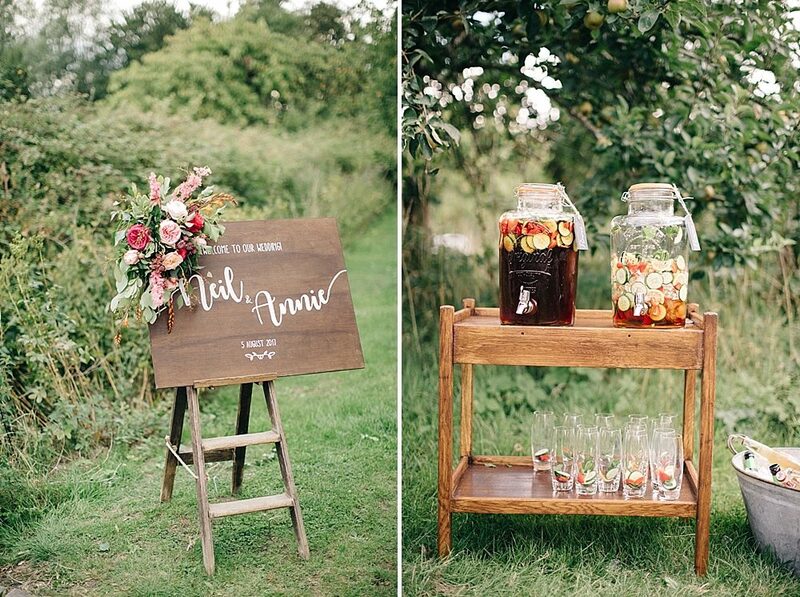 We wanted to make the most of the natural beauty of the orchard and barn, but also to bring a bit of wow factor and lots of personal touches. As the venue was a complete blank canvas, absolutely everything that filled it was chosen and hired/made by us. This gave us an amazing opportunity to shape our day, but I must admit at times I became quite obsessed with things I never thought I’d dedicate so much headspace to, like chairs and tablecloths!! We got our gorgeous rustic furniture from Classic Crockery – my excitement when I realised they stocked oak crossback chairs (much lusted after on Pinterest) can’t be understated! My very talented Mum made the table runners with some (cheap as chips!) chiffon from The Fabric Room, and we collected loads of brass and glass vases for the table settings from eBay and charity shops. Neil designed all our signs in photoshop, which we then hand painted using white tracedown paper to transfer the designs onto oak-stained MDF panels. It was really important to us that our gorgeous cats Xena and Leia were part of our day in some way, and once we ruled out the idea of them actually attending the wedding, we decided a visual tribute was necessary. Neil created some portrait style ‘oil paintings’ of them in suitably regal poses, which we framed and hung above the bar so they could oversee the fun! The bar set up was provided by The Libation Station and looked awesome. 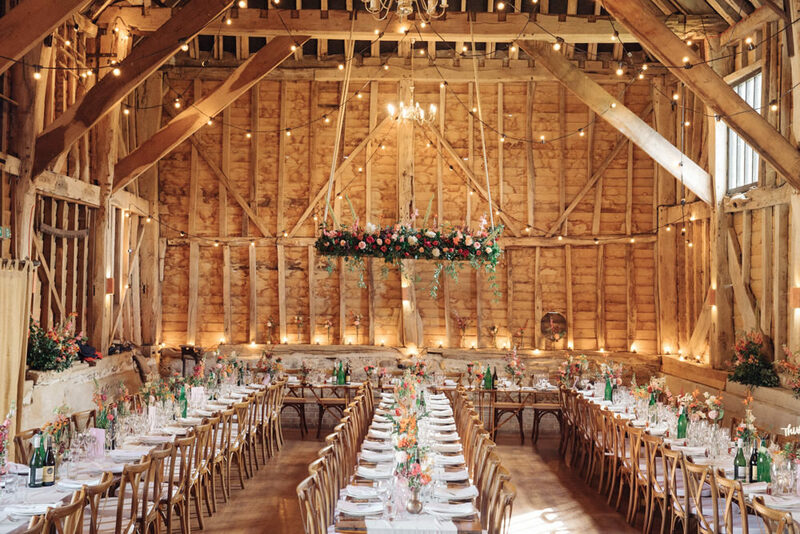 We hired 200 metres of festoon lighting from IA Sound and Light, which filled the barn with the most amazing cosy glow! A massive shout out goes to our brothers Jack, Nick, Sean and Tim who spent the two days before the wedding at the top of a scaffolding tower hanging the lights – nerves of steel!! And the flowers… the beautiful, amazing flowers were provided by the super talented Joanne Truby. Being a lover of spring flowers like peonies and ranunculus (who isn’t! 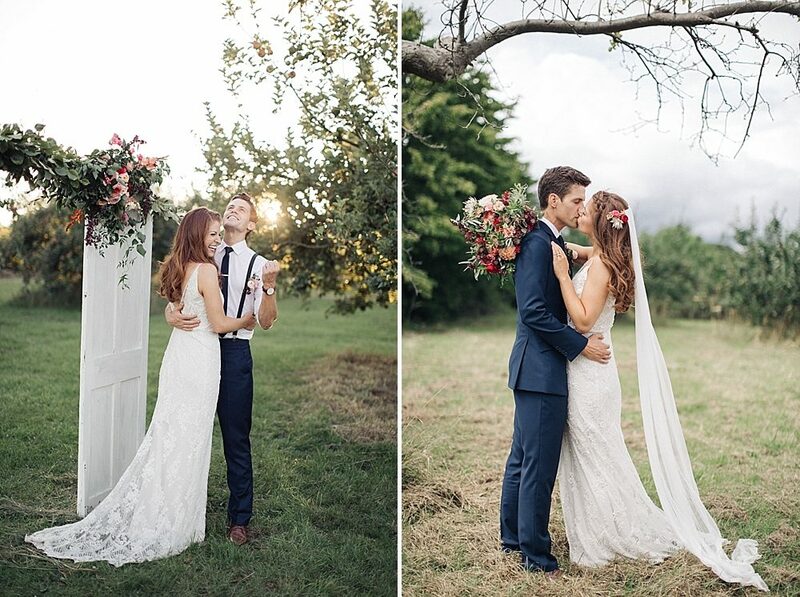 ), I was worried that it wouldn’t be possible to achieve the look I wanted for our August wedding, but with Joanne on board I never should have doubted it! She designed a floral feast, creating a showstopping floral plank for the barn and runner style arrangements along the aisle in the orchard. We sourced, painted and distressed two old wooden doors, and my Dad created the structure to hold them up. Joanne draped flowers and foliage over the doors to create a stunning ‘entrance’ to our outdoor ceremony area. My very game bridesmaids agreed to arrange the table flowers to help save a few pennies, which they did beautifully over a couple of bottles of Prosecco the evening before the wedding – superstars! This was the part of the day I was most nervous about as I hate being the centre of attention, but it turned to be one of my favourite parts. Having an outdoor ceremony was really important to us, and we planned to set up in the orchard – although we did have a plan B option inside the barn in case the weather didn’t cooperate. On the morning of the wedding we woke up to rain forecast, although none of the (many!) weather apps we checked agreed on exactly when it would be. Thanks to some gutsy decision making from Sama, we decided to go for the orchard dream, and I’m so glad we did. It wasn’t exactly the perfect summer ceremony we’d imagined – dark clouds were swirling above us as I walked down the aisle, and the wind was so strong it blew our altar flowers off the barrels, twice! My veil managed to wrap itself around the microphone stand at one point, and we had to reposition to avoid flying objects in the wind, but it honestly didn’t matter at all all – in fact the slightly farcical vibe made it feel more intimate and even more special! As the barn isn’t licensed for outdoor marriages, we decided to have a humanist ceremony. Celebrant Kate Gee wrote a lovely, super personal ceremony for us, and we had two readings. My mum read a Native American Apache wedding blessing, which we felt was beautiful and really summed up how we try and approach our relationship. My brother Nick (also Neil’s groomsman) read a personalised version of the wonderfully weird ‘Scientific Romance Redux’ by Tim Pratt, which really represented Neil’s personality – totally geeky whilst also being incredibly romantic in its own special way. We made a playlist for the drinks reception full of songs that make us happy and remind us of good times! We spent many an evening dancing in the kitchen as we put it together, and now after the wedding it’s our go-to playlist when we’re hanging out at home. We booked the AMAZING band Mister Kanish for the evening and they went down a storm with our guests! They played such a fun set list which had something for everyone, from ‘Brown Eyed Girl’ to ‘Gangsta’s Paradise’ – they got everyone on the dance floor and made the party so memorable. We booked The Flavour Kitchen to provide an italian feasting menu – the food was delicious and it was so special to look out across the barn at all our family and friends enjoying it together. 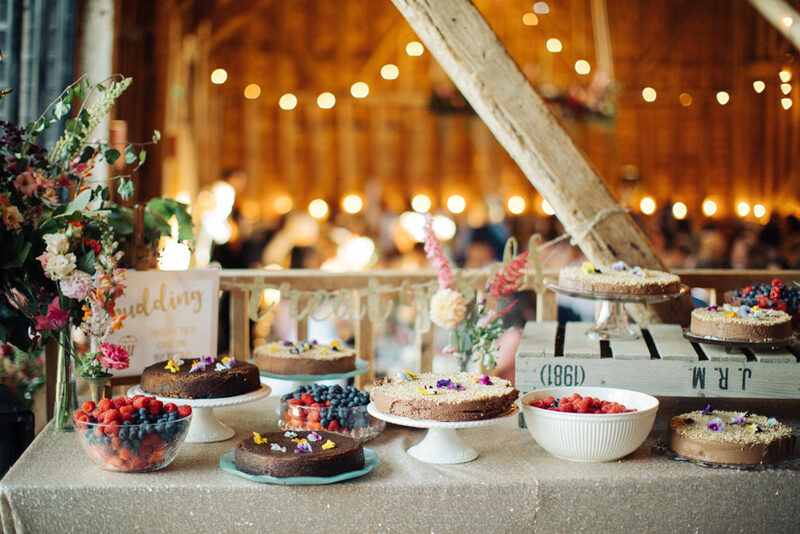 Neil’s mum created an amazing cake table of Neil’s favourites – chocolate torte and coffee cake along with berries and cream. Needless to say they were polished off my our guests pretty quickly! The photography was important to us from the start – whilst Neil is super photogenic, I am very awkward in front of the camera, so we have very few great photos to show for our ten years together. I knew it would take someone great to make me feel (and look!) remotely comfortable having my photo taken – enter M&J! We loved the light and colour in their portfolio, and had absolute faith they would be able to capture the beauty of the setting perfectly. 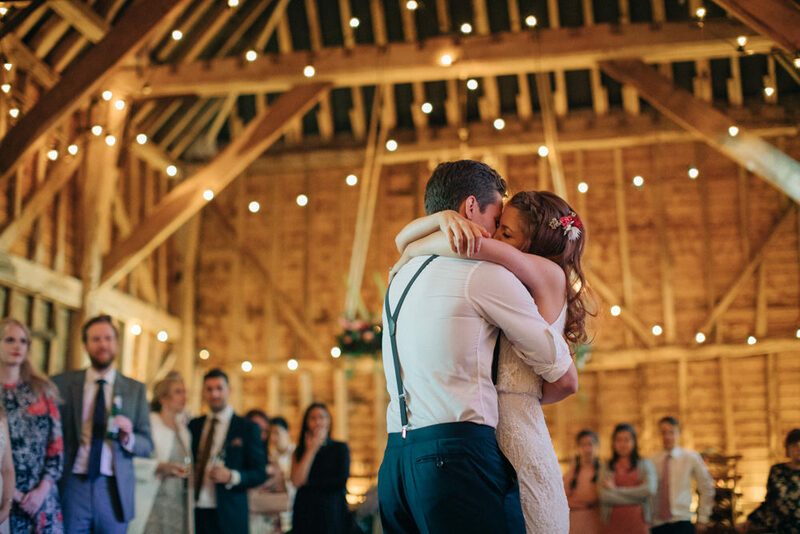 We were blown away when we got the photos back – the barn looks stunning, we look like the best versions of ourselves, and they captured so many lovely natural shots of our guests. We had dithered over whether to book a videographer, but we decided to go for it and I’m so glad we did! Dan and Hannah of Dan Dolan Films were so much fun to have around on the day, and we will treasure the incredible video they have created forever. It was amazing to see the day play out from a totally different perspective – I still can’t watch it without crying! We spent over two years planning our wedding, and at times we questioned why we’d taken on such an ambitious project (in fact an elopement was mooted more than once)! But I can honestly say that the hard work and stress was totally worth it – we had the best day of our lives and it was so special to spend it with all the people we love. For any dry hire brides feeling the fear, it’s a cliche but it’s true – all the little details you’ve obsessed about won’t matter on the day, all that matters is the promises you’re making to your favourite person in the world. When the day arrives let go of the stress and allow yourself enjoy whatever the day brings – the moments where things don’t quite go to plan are often the most memorable! On the advice of Neil’s sister, we stole a few minutes in the orchard alone with a bottle of fizz, while our guests enjoyed some post-dinner drinks around the firepit. The sun was going down and we could hear our guests chatting and laughing on the other side of the barn – it was a magical moment. Make sure you build some alone time into your day and task someone with reminding you to do it! It all goes by in a blur but those brief moments together will stick with you forever. Wow!! Beautiful wedding!! all details are amazing and that dress….!!! stunning! !